Where I’m from there’s a well-known custom we like to call ‘Southern hospitality.’ Much to my and my fellow Southerners’ delight (I’m talking about Nathan, Rae, and Raffi), Southern hospitality extends to our current location in the southeast of Turkey. 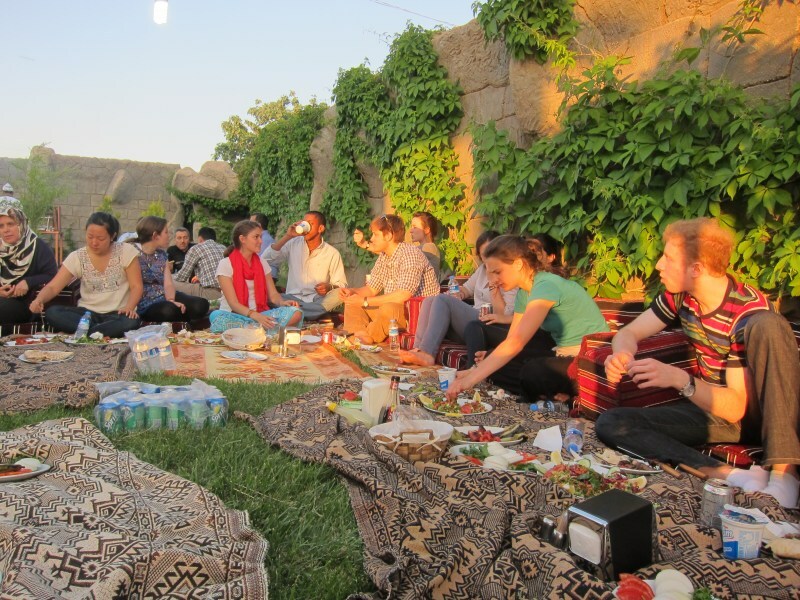 Upon the group’s arrival to Şanlıurfa, we piled into a mysterious, low-lit cellar with tables elevated just above the ground surrounded by cushions and stacked with a breakfast that included multiple plates of cheese, tomatoes, cucumbers, eggs, pide (flatbread), olives, nuts, pastries, etc. After five days in Urfa, I almost find it unnecessary to mention the endless curved glass cups of çay (tea) that followed our first feast and that would also accompany every single meal and meeting here. At this time however, we were unaccustomed to such practices and our hosts’ laughter at our Western astonishment intermingled with the twang of a sitar-like instrument playing in the background. We weren’t in Istanbul anymore. My suspicions of this unusually high level of Turkish-style Southern hospitality were soon confirmed. During our four nights here, we have subsequently been welcomed into the homes of four amazing families. On our first night the group split in two, separately making our way to the homes of two Urfan families, unaware of the warm welcome to come. Turning the corner into the dining room post-removal of shoes, my heartbeat quickened and my eyes widened as a literal banquet of traditional Urfa kebap, chicken şis, roasted eggplants, onions, tomatoes, hot peppers, salad, çorba (lentil soup),ayran (yogurt drink), spices, cilantro, parsley and even more bread radiated deliciousness before my humbled being. We sat down to eat Urfa-style, cross-legged on a carpet on the floor, throwing a mix of kebap, spices, peppers, and a variety of other foods into a wrap-style bread and then rolling it all together burrito-style. 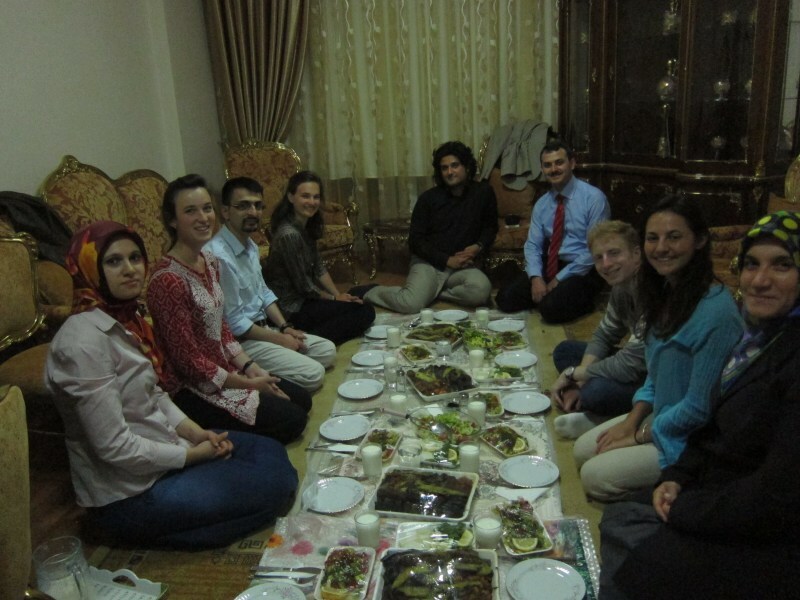 Unimpressed with our skills, our hosts generously made döner rolls for us and assured us that this lavish welcome exemplified standard Urfa tradition. We laughed and ate heartily, unaware that our hosts would soon goad us into eating as much as possible. Now a daily occurrence, we found ourselves food-comatose, yet again ignorant to the many cups of çay and plates of şillik (a crepe-like dessert filled with walnuts and drenched in syrup) to follow. 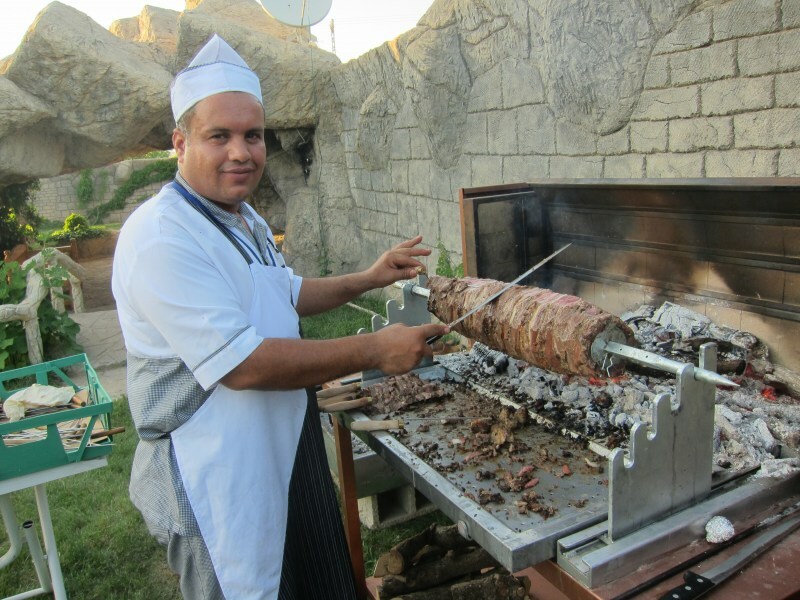 At this point a commendation of our courageous translator Mustafa is necessary, who, as one of two Turkish guests, received the brunt of the Urfa force-feeding and managed to translate for 3 hours straight. 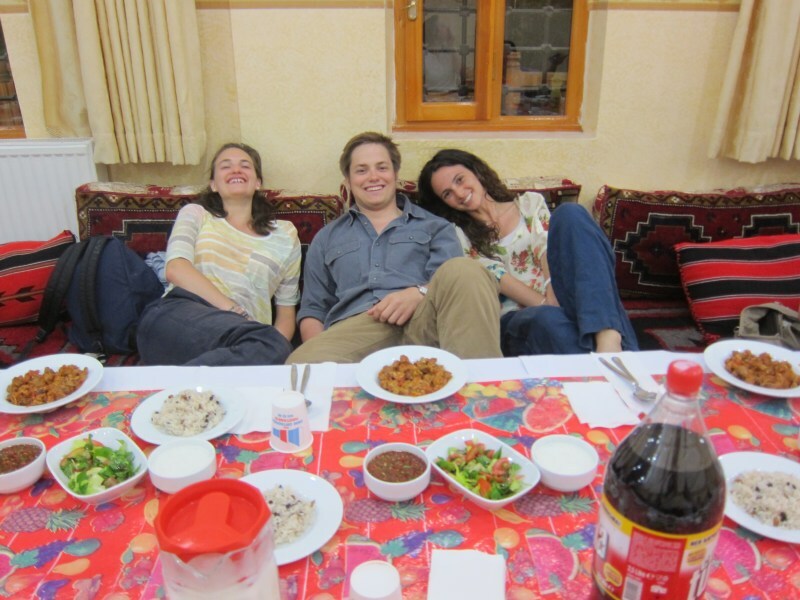 This behavior continued each time we entered a southeastern household, with variations of baklava, lahmacun (Turkish “pizza”), yogurt salads, rice dishes, and a lamb roasting on a spit making various appearances in a village leader’s home, an imam’s office, and an eye surgeon’s country house, respectively. The conversation matched the food, as Turkish and American politics and culture were discussed with questions from both parties. An invitation to return (and to visit our homes) accompanied every single goodbye. Çok teşekkür, Urfa! You have outdone even the most hospitable displays of Southern hospitality as we once knew it, and I for one do not know what I will do without the warmth of the people or the endless trays of kebap, baskets of pideand cups of çay. I am proud to report that just as in the U.S., the South is the place to be in Turkey. 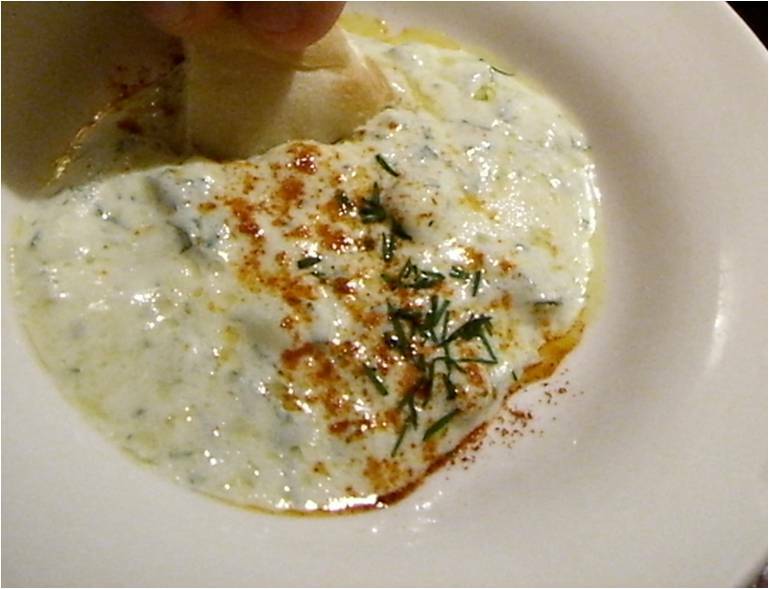 Our first few nights in Istanbul, the Globalist reporters and I dined in restaurants, sampling kebaps and shish. Although we all found the food delicious, we quickly realized that sticking to street carts and food counters was cheaper and more convenient, but equally tasty. 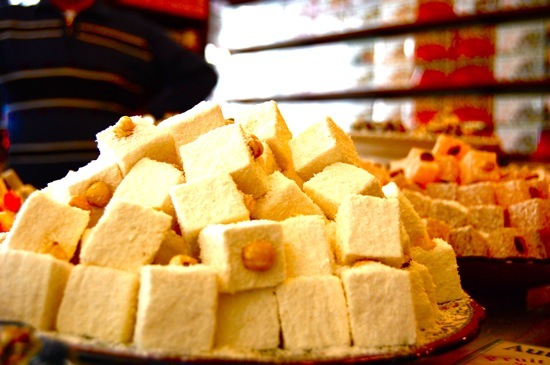 The winding streets of Istanbul provided us with quite a few exciting and delicious experiences, so I wanted to give a recap of just a few of our favorites. 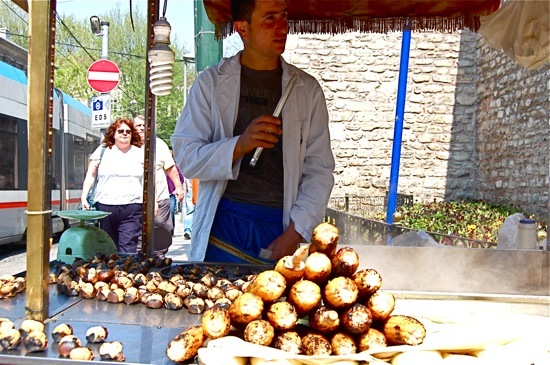 Vendors roll food carts up and down streets and alleys all day, selling grilled corn, grilled chestnuts, and simit, or large, thin bagels covered in sesame seeds. All seemed to be quite a bargain, though many of the Globalist staff seemed to like the chestnuts the most. 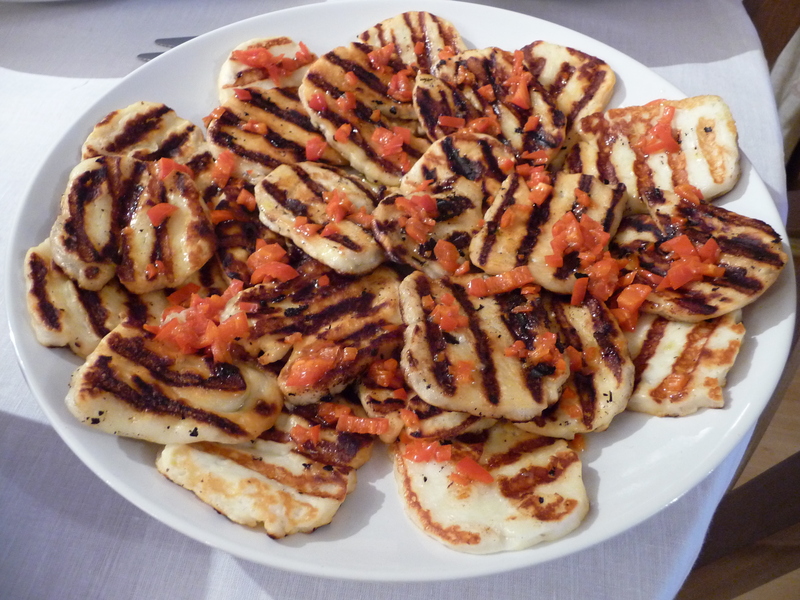 They were always warm and fresh, pulled straight from the grill and plopped into small paper bags. Almost as unanimously popular were the midye dolmasi, mussels with rice that were spritzed with fresh lemon juice immediately before serving. 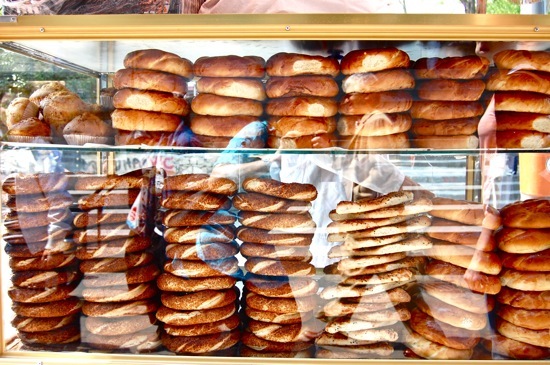 Margaret, our intrepid street food taste-tester, also tried both the corn and the simit. She found the taste good, but the bread stale. The corn looked grilled to perfection, but several of us agreed that it just did not taste as good as the American equivalent (which made Luke, our reporter from Nebraska, or cornhusker territory, very pleased). Along the Golden Horn, we also found fish sandwich carts. Fishermen line the sides of the waterway and give their fresh catches directly to these carts, where the vendors season and grill the fish before placing it with lettuce, onion, and lemon juice in a soft baguette. For only 4 Turkish Lira (about $2.50), this sandwich proved a life-altering experience, leaving some of us to declare that we would move to Istanbul and live the rest of our lives eating nothing else. 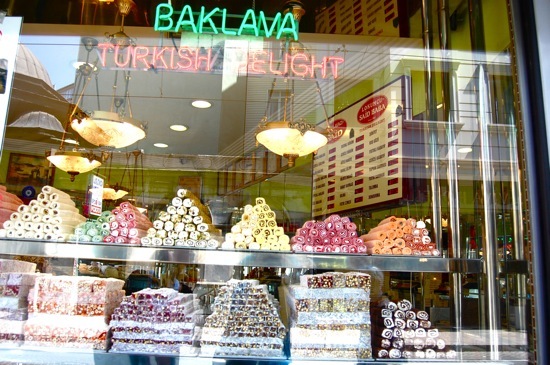 On our first day walking through Istanbul, a few of us agreed that we all wanted to try Turkish delight, but realized that all we knew about them was that they were Edmund’s Achilles’ heel in the novel The Chronicles of Narnia: The Lion, the Witch, and the Wardrobe. 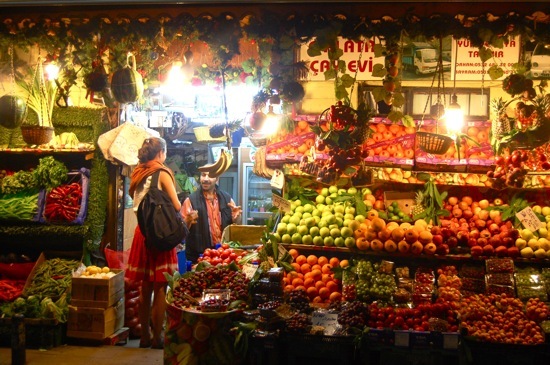 As we ventured into the Spice Bazaar to sample, we found the gummy, nutty treats sweet. 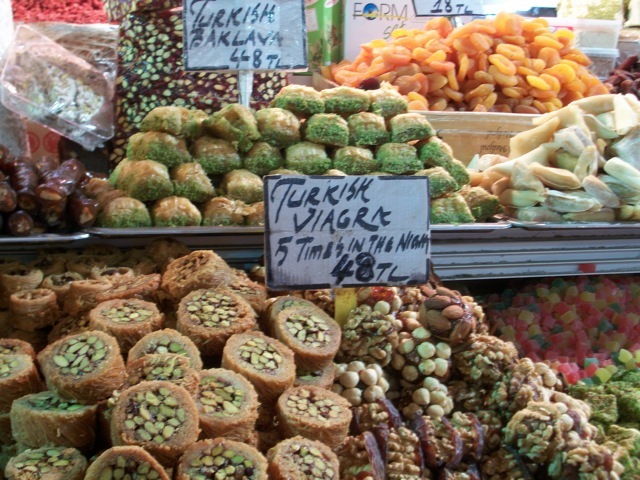 We enjoyed nibbling, but became distracted by the signs for a mixture of dried fruits and nuts, advertised with signs bearing the name, “Turkish Viagra.” Though the signs elicited quite a few chuckles, none of us proved adventurous to try them. Almost as intriguing as these signs, the dondurma, ice cream, carts all across the city drew our attention long before our money. The vendors rang bells and mashed the ice cream with long poles, swinging massive chunks around above their heads. They scooped out the ice cream in flattened slabs, which they then piled upon cones. The vendors would wave the cones at potential buyers, tempting and teasing, before eventually winning them over with the creamy pistachio, chocolate, or vanilla scoops. 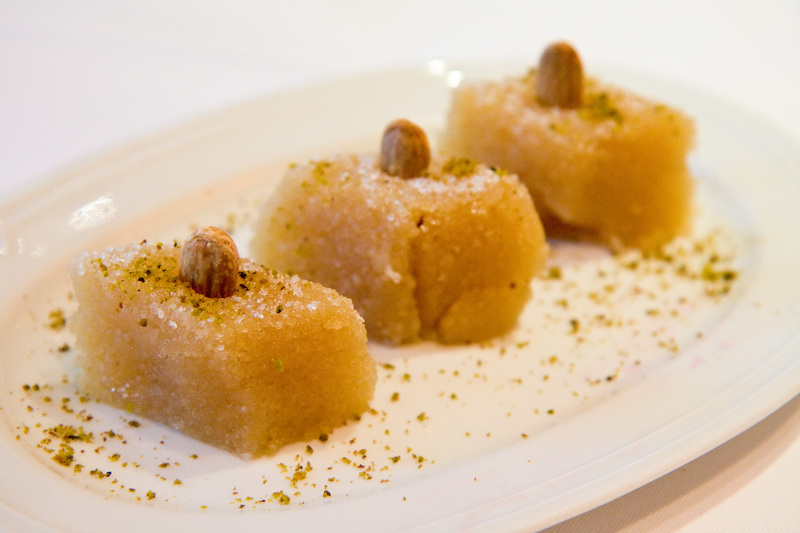 Among the sweet treats, all of us seemed to prefer the delicious baklava we found everywhere. I had believed baklava was distinctly Greek, but after eating more baklava than I could (or would want to) count, I can confirm that the Turkish people love baklava too. The types of baklava we devoured varied, as some had pistachios, some had walnuts, some were round, some rectangular, and some chocolatey. Differences aside, all had buttery, flaky pastry and nuts, glued together with gooey honey; more importantly, however, all were delicious. The first word I learned here in Turkey was çay (pronounced chai), or tea. In Turkey, tea is more than just a beverage; tea also represents a common courtesy and means of social interaction. Shopkeepers, cafes, and even Turkish families all have similar hourglass-shaped cups to hold the rich, black çay. 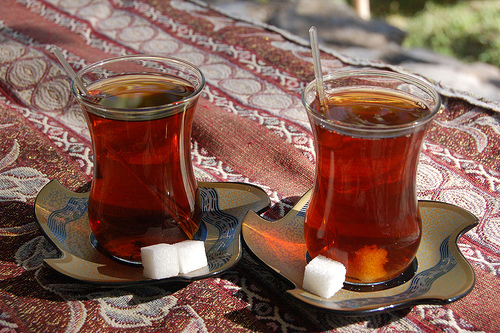 Turkish people generally serve tea on small coasters with accompanying cubes of sugar. Some find the tea too bitter and enjoy adding and stirring in sugar; I relish the rich, smooth flavor and find myself gulping down too much tea every time I have the chance. At interviews and meetings, the appearance of tea cups signifies that the host feels ready for a real conversation, but in a comfortable environment, as if to say in a respectful, familiar way, “let’s get down to business.” In rug shops and the Grand Bazaar, store-owners bring out tea in a strategic attempt to woo a potential buyer. In homes, like the one several of my fellow reporters and I visited for dinner, the hosts bring out tea with dessert, prolonging the dining experience in a comfortable, calm environment. 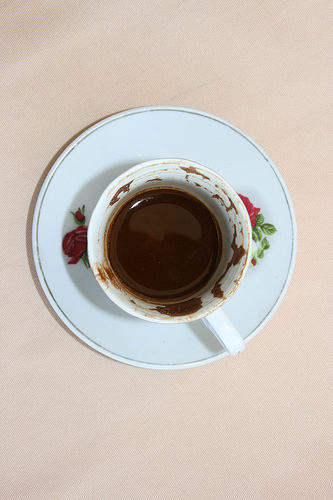 Although not as common as çay, Türk Kahvesi, or Turkish coffee, has a special place in Turkish culture. Before I arriving, I knew that I wanted to try this legendary drink. I had heard Turkish coffee was very rich, but I drink coffee black, so I figured it would be similar to that. I was totally wrong. Served kind of like a shot of espresso, Turkish coffee is thick and slightly sweet. A layer of sludge sits like mud on the bottom of the cup and tastes richer than any coffee I have ever tried before. In fact, coffee seems like a misnomer since it is so far removed from anything I would expect to find at a coffee shop. A few sips into the drink, I glanced over and say that some of my fellow reporters gulped down the entire cup, eyes gleaming as if ready for more. I, on the other hand, could not handle any more. So I have spent the rest of my time in Istanbul ordering çay. Drinking çay and Turkish coffee present such special and uniquely Turkish experiences. Neither would seem quite the same served in an coffee shop in America or carried in a 12-ounce to-go cup. Although it would be impossible to understand the complex culture and history of Turkey in only two weeks, to drink çay like a Turk provides a special glimpse of a uniquely Turkish experience. So as we continue to report from this incredible country, we will continue to drink çay, and gulp down as much Turkish culture as we can.